In the mid- to late 1800s, the mid-western region of the United States emerged as the epicenter of a historic oil drilling boom. Speculators, inventors, laborers and curious souls converged to seek fortunes and adventure. Life in the oil fields was rough and often dangerous. And, if the work wasn’t demanding enough, the men had something else to contend with – rod wax – a dark, paraffin-like crude oil residue that formed on the mechanical parts of oil rigs. The substance made repairs time consuming and complicated, and the men hated the sight of it, for they had to remove it constantly. It wasn’t long, however, before the workers discovered rod wax had at least one redeeming property. If they left it on their skin, it hastened the healing of burns and cuts because it protected the exposed tissue from getting infected. An enterprising chemist, Robert A. Chesebrough, noticed this effect and began refining small quantities of the substance into a wonder salve. In no time he was producing an acceptably attractive white oil product and pitching its cosmetic medicinal benefits. Within a decade, Chesebrough’s rod wax-based product became known as Vaseline®. Other entrepreneurs followed suit, and their experiments led to generations of white oil products that line cosmetic counters and store shelves today. One of those early oil refiners was the company we feature in this case history. For more than a century, the company’s innovative research labs have yielded highly refined mineral oils that are hydrophobic, tasteless, odorless and colorless. They have been the source of refined white oil products that personal care product manufacturers and pharmaceutical companies use to formulate their lotions, creams, ointments and hand cleansers. Refining mineral base oil involves a number of chemical processes that require large amounts of water. Add tank washdowns and you end up with a lot of oily wastewater that has to be treated and discharged. To handle this volume of water, five API oil/water separators, or “pits,” are located throughout its plant site, each equipped with slotted pipe oil skimmers (weirs). Fifty years ago, when they were installed, the weirs were considered an effective solution for oil removal. Today’s more stringent wastewater treatment requirements, lean manufacturing and the market for reclaimed oil demand a much higher level of skimming efficiency, however. For these reasons, the company began to consider alternative oil removal methods. A Project Manager at the company noted yet another problem that caused the company to compare different skimming solutions; residual waste oil floating on the surface of the API separators would turn orange in color, which was expected, but easily noticeable to customers and regulatory agencies conducting site audits. When the Oil Skimmers, Inc. Model 6V Brill® oil skimmer was installed for demonstration, the surface oil was quickly picked up by the skimmer’s free-floating collector tube. The Model 6V operates using a specially formulated, closed loop, flexible tube that floats on the water’s surface. Oil adheres to the tube, but water is repelled. The skimmer continuously draws the oil-covered tube through scrapers, and returns the clean tube to the water’s surface to gather more oil. The skimmer's collector tube snakes over and around any floating debris in the pits, and continues to remove oil even when water levels fluctuate. The recovered oil flows by gravity through the mounting system to totes for storage, and then sold to a recycler. “Before we even turned the unit on, we noticed how the Model 6V was constructed. It seemed like a very rugged and durable piece of equipment as compared to other skimmers we looked at. We knew it would be well suited to handle the weather and harsh conditions of our application,” the project manager says. The Model 6V quickly proved its skimming ability, as well as its adaptability to the company's application without incurring them significant downtime or expensive retrofitting costs. 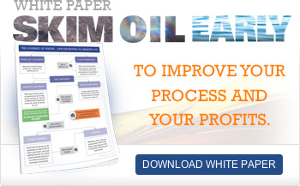 In addition to plant efficiency improvements, the quality of the oil recovered represents a significant return on the company's investment in the tube-type skimmers. The company's API pits are now clear of oil. Their wastewater department is delighted, and oil removal is far more efficient than before. On top of that, the tube skimmer results give site visitors a positive impression of the company’s operations. A custom vertical installation allows each skimmer to be moved back and forth over a pair of pits. The Model 6V was designed to allow for a wide variety of mounting options and many pre-engineered mounts are also available. The addition of Model 6V Brill oil skimmers have transformed the company's oil removal efforts into an efficient, automated, continuous operation where personnel time isn’t spent on manual adjustments, maintenance or repairs.